A young male Wild Turkey keeps an eye out for danger while feeding in a field. The Native Americans shared the Thanksgiving tradition with the Pilgrims, who could not help but be amazed at the bounty of nature and how much food could be hunted and gathered from the wild. 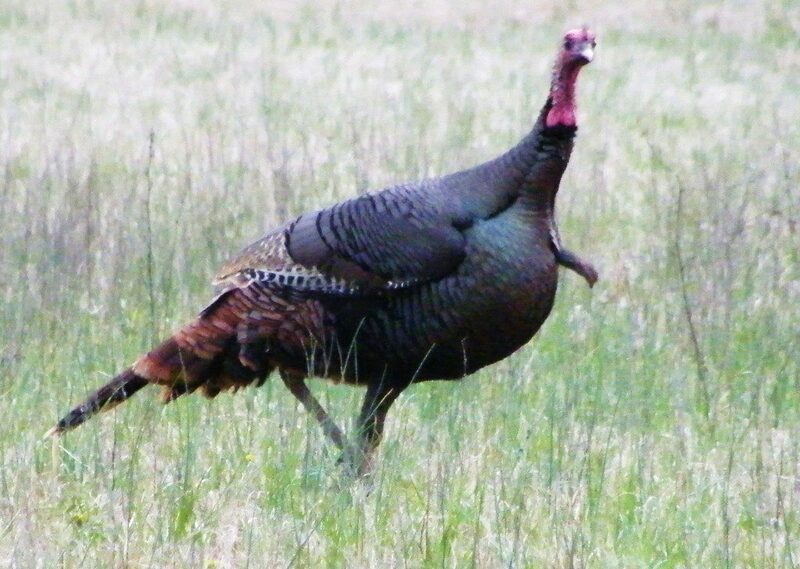 The Wild Turkey later became the symbol of the holiday, for this regal gamebird was abundant and doubtless provided many meals for our Pilgrim forefathers. Wild Turkey populations almost disappeared, but conservation efforts have brought their populations back to abundance. Today there are nearly 8 million Wild Turkeys across North America. As we gather around tables today to celebrate the harvest and the bounty of nature with plates heaped high with food, take time to reflect on the meaning of Thanksgiving. While most of us enjoy easy access to food and the other necessities for survival, the wildlife around spends every day in search for food. Be glad you don’t have to go outside and gather your food everyday! 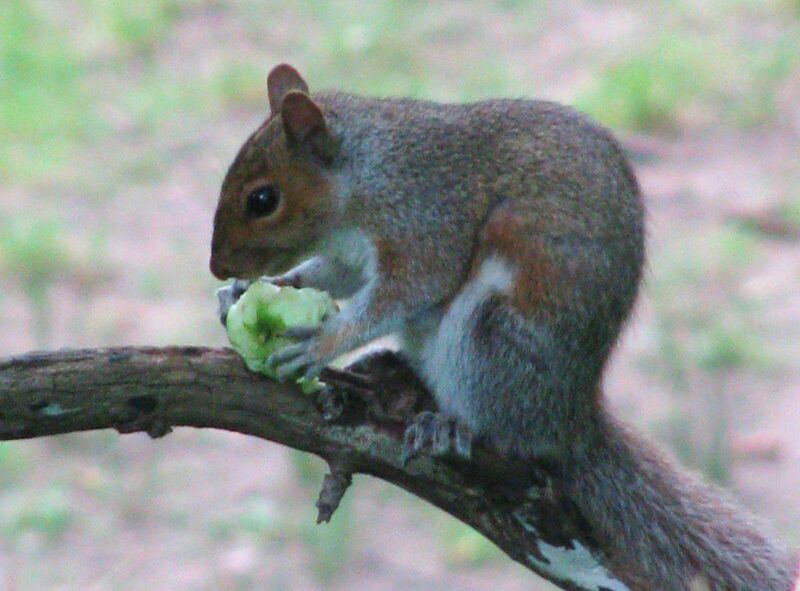 A Gray Squirrel devours a wild apple. The squirrels, the turkeys, and all the other wildlife have a daily challenge to put enough food in their mouths. When fall arrives and nature’s bounty is laid out, it’s no wonder that the animals feast and gorge– just like us! 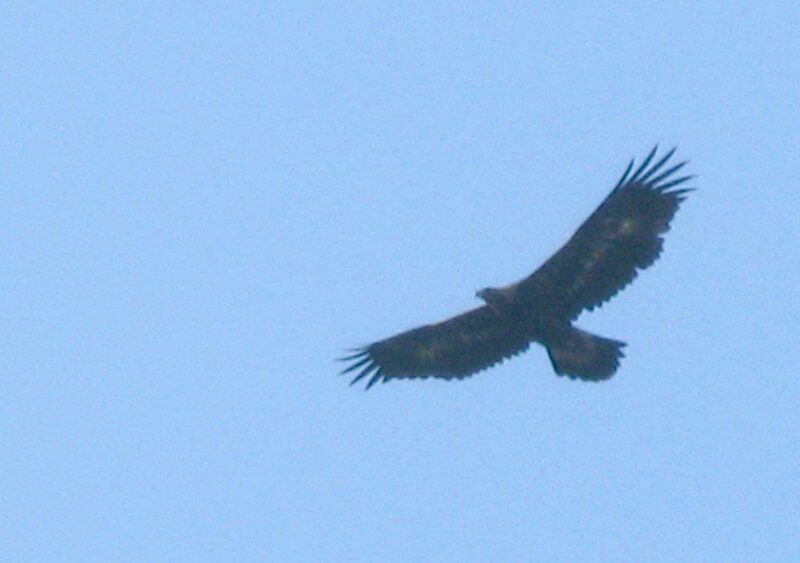 Running late on Wednesday to meet up with William Ryan, director of Bucktoe Creek Preserve, I turned onto Sharp Road and witnessed a stunning sight overhead: an immature Golden Eagle flying at treetop level, circling tightly in beautiful sunlight. 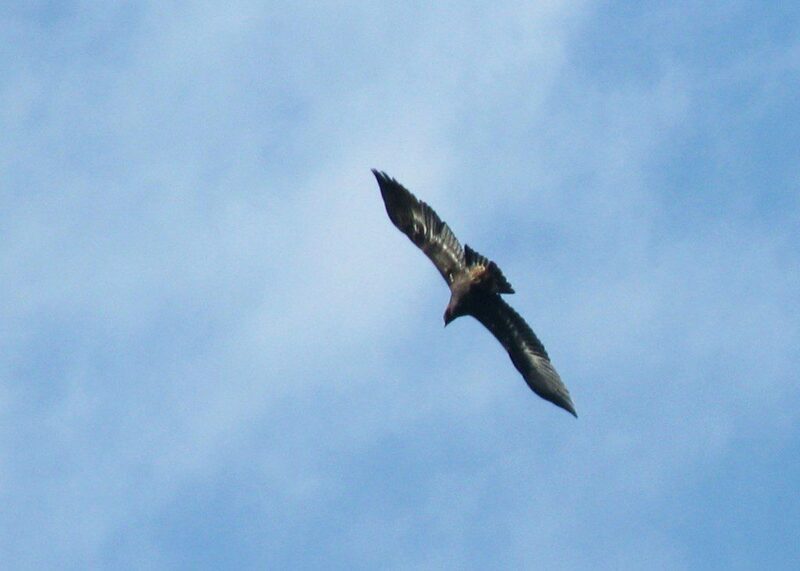 I pulled the car over, grabbed the camera, and snapped off some photos as the eagle drifted to the southwest. Getting back to the car, I found my cell phone ringing. William was watching the eagle from the top of the hill, where he’d witnessed the majestic bird glide across the hayfield in front of him, just six feet off the ground! Golden Eagles are uncommon migrants along the East Coast, travelling through primarily in the months of November and March. 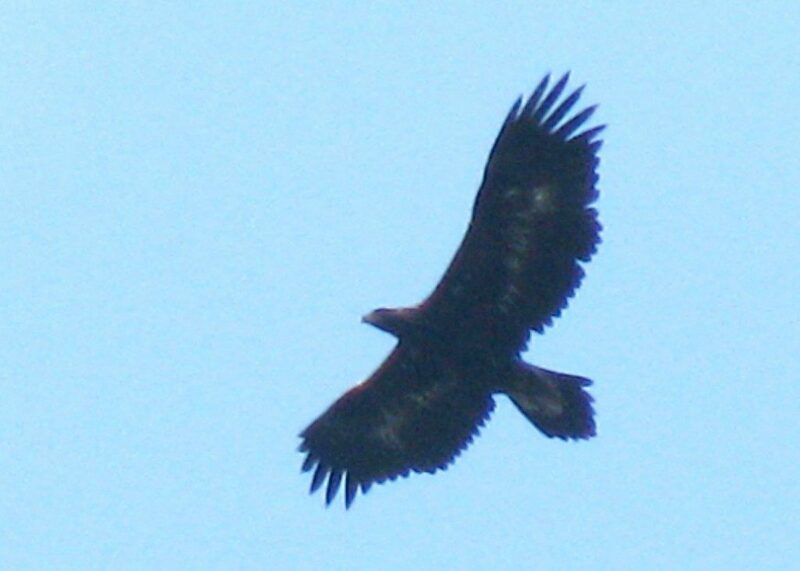 We have seen 12 Golden Eagles fly over the Ashland Hawk Watch so far this fall. On rare occasions, a Golden will winter in the mid-Atlantic, usually in marsh or grassland habitat that offers plenty of small mammal prey. The Golden Eagle’s smaller head, longer tail, and different flight style distinguishes this bird from the more-common Bald Eagle. A Golden’s wingspan is an impressive 7 1/2 feet! This Golden Eagle was a new bird for the long-running survey at the Bucktoe Creek Preserve, and became species #190 for the list. What an exciting sighting! Continuing our story of wintering hummingbirds, the big question is: how do you attract one of these birds to your yard? During migration, these remarkable birds navigate through the landscape of suburbia and manage to find tiny a tiny oasis of habitat that can sustain their basic needs. If an ideal location is found, then that is where the bird may spend its wintering period. 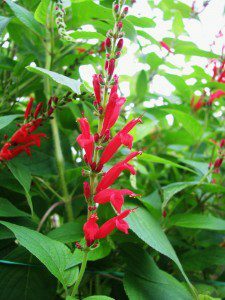 Blooming Pineapple Sage is very attractive to hummingbirds. Photo by Derek Stoner. 1. A feeder that is kept full of fresh sugar water(and not allowed to freeze solid). Heat lamps on the feeder are a way to solve the freezing issue. 2. Thick cover for the bird to roost in at night. 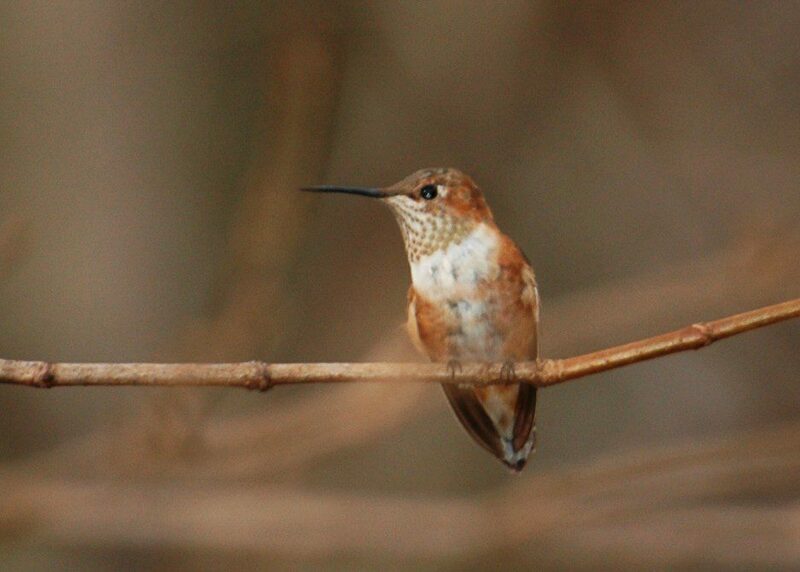 Rufous Hummingbirds seem to prefer to roost in an evergreens or thick vines. 3. Late-blooming flowers such as sage, that provide a natural nectar source. 4. Native plants that host a variety of insects and spiders for the hummingbird to eat. Arthopods make up a large percentage of their winter diet. 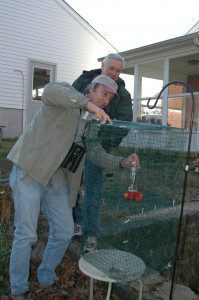 Bruce Peterjohn, a professional bird bander, places a wire cage trap around the hummingbird feeder at Jim White's home. Photo by Jim White. 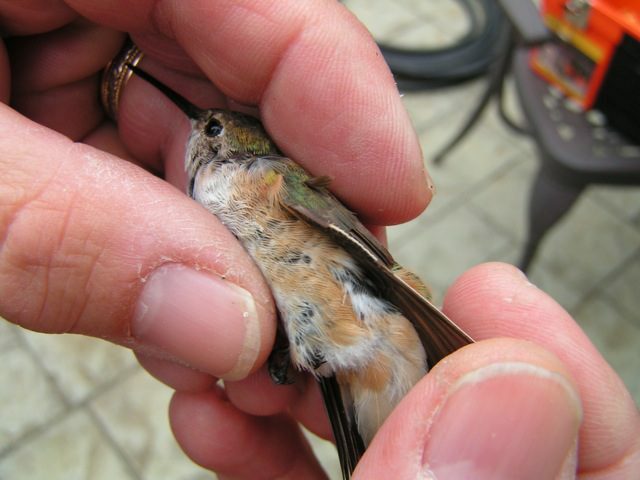 If you are so lucky to attract and host a hummingbird during the winter, you have the unique opportunity to have the bird banded for science. A professional bird bander with special training in hummingbirds can use a simple trap to capture the bird, which is then weighed, measured, banded(with the tiniest of metal bands on its leg! ), photographed and released. Through banding efforts, scientists have learned that some hummingbirds will return to the exact same backyard winter after winter. This evidence points to the fact that we are observing a natural phenomenon, and not just the case of some birds getting lost and ending up on the east coast. An example of adaptive behavior may the reason for this situation, as these hardy birds are finding suitable habitat here without migrating all the way to Mexico or Central America. So, keep your hummingbird feeders up, cross your fingers, and let us know if a little rust-colored hummingbird shows up in your yard this winter!